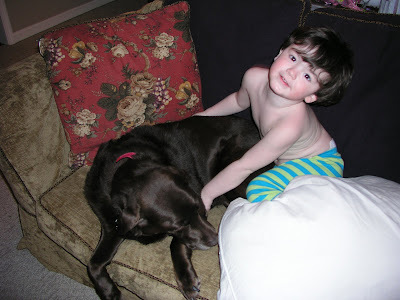 Clark was ALWAYS loving on Maddie. 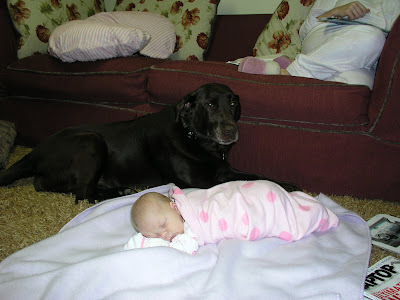 Madison watching over baby Bella Ruth. Clark hanging out with Madison and Jenni. Maddie and Jenni on the basement stairs. 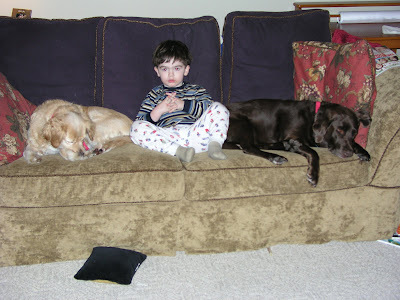 Our sweet dog Maddie, or "Maa Maa" as Will Henry says, went to dog heaven after a short illness on Tuesday, October 28. 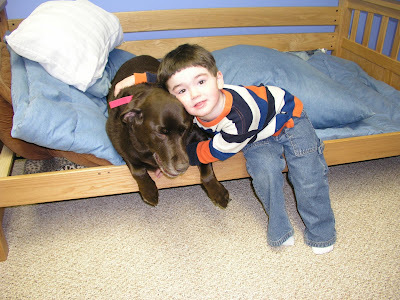 She was a 14 year old chocolate lab that I had since my first days of teaching in Oklahoma. This has been an extremely big loss to our entire family. Chris, Clark and Bella Ruth are making a beautiful wood box for her, and I am making a quilt for the inside. Her final resting place will be on our lot under a Magnolia tree. It is very fitting because she spent the first 6 years of her life under a Magnolia tree in my backyard in OKC. We love you and miss you Maddie! Rest in peace sweet Madison! Have fun playing with our Hunter and Petie! Oh, Chesnye...I am so sorry for the loss of your sweet Maddie. I will whisper a prayer for you. I am so sorry. She was such a great dog. You guys are in my prayers. I'm so sorry to hear of your loss. It's hard to lose a pet (family member) that is such a part of your family. We lost our bulldog Max in the spring. Our home was just too quiet so we added Bozley to our family. I am so sorry for your loss. It is so painful.